Do You Need a Fire Pit? Whether you are in the process of building a new patio, or looking to make some enhancements to a current patio, an outdoor fire pit can be a wonderful addition. A fire pit is a great way to entertain your friends and family on those nice Batavia summer nights. If you are looking for a relaxing way to spend some time outside, building a fire pit into your patio might be a good option for you. In addition to becoming the focal point while entertaining friends and family, a fire pit offers several other advantages to your home. Grilling – A fire pit can serve as a larger grill, if you get one that comes with a grate. Because of the surface size, they are often a roomier place for cooking up your favorite meats than the grill. This allows you to cook for large groups at once, or more complicated meals that may take up more surface area on a normal grill. Staying warm outside – Those chilly fall and winter nights can make you feel a bit claustrophobic. They can keep people inside and feeling a little stir crazy after awhile. Well, a fire pit predictably brings the heat. It can make it comfortable to spend the evening outside warming your extremities. Resale value – A fire pit does not require much upkeep. It is an amenity that can make your home stick out from other similar homes in the neighborhood or town that you live in. For these reasons, a built in fire pit can help the resale value of your home. If you think you might want to sell down the line, a fire pit is a small investment that can pay off down the road. Ambiance – A built in fire pit will become a dominant feature, beautifying the look of your patio. 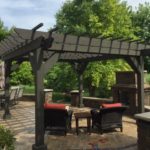 It offers stability and utility and is something that should enhance the design work, tying your back yard together. Whether you are entertaining large numbers or gazing up at the stars with your loved one, a built in fire pit can make your back yard the perfect place to spend an evening, summer or winter. 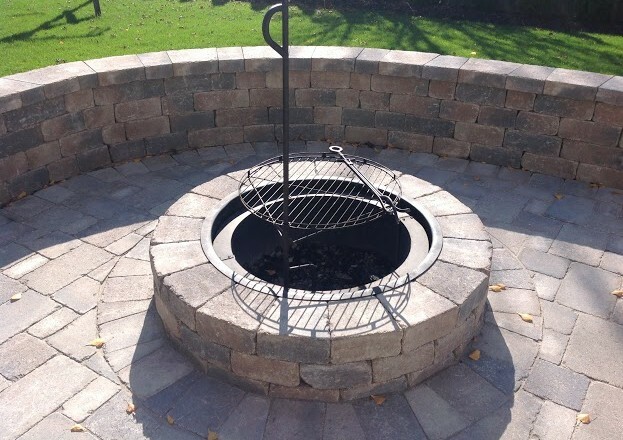 Contact us today to add a fire pit to your patio!